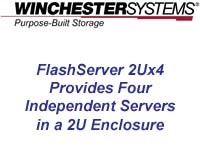 Video shows how the FlashServer 2Ux4 cuts cost, reduces rack space and saves power. It is an ideal product for server consolidation, for high density, general purpose server environments and for deploying converged infrastructure or hyper-converged solutions. Jim Picard shows how FlashServer HA provides continuous operation despite server hardware failure -- without clustering software.